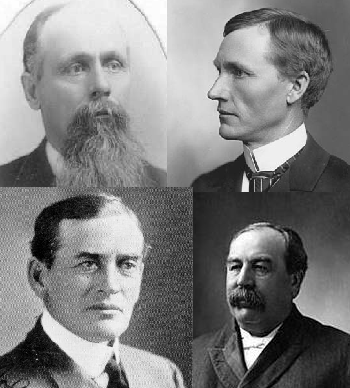 Clockwise from top-left: David M. Clough, John Lind, Samuel R. Van Sant, John A. Johnson. As I’ve written elsewhere, given my time at the Initiative, I’ve developed an interest in Big Data analysis and how this methodology can be applied to history (“the digital humanities”). Specifically, as collections become digitized, the sheer volume of resources ought to inspire historians to find new ways to engage and manage information. While the result will only be as good as the analysis, it has the potential to reveal trends that otherwise may be implied but not obvious. 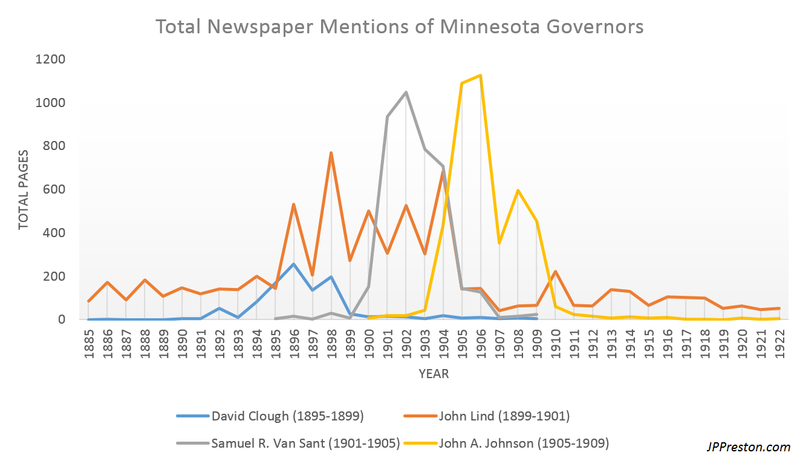 The following tracks the state newspaper mentions of particular keywords — in this case, names — of four Minnesota governors: David M. Clough, John Lind, Samuel R. Van Sant, and John A. Johnson. For example, every instance in which “John” and “Lind” appear within five words of one another on a Minnesota newspaper page, that page is counted. Searching for variations of how these individuals were addressed (such as “Governor Van Sant” rather than “Samuel Van Sant” or “S.R. Van Sant”) yield different counts but the overall trends are the same. (Note: Prior to 1962, Minnesota’s governors served two-year terms). Figure: This graph represents the total counts per year of particular keyword usage in 28 Minnesota newspapers (~330,000 scanned pages). Keywords include “Governor Clough”, “John Lind”, “Governor Van Sant”, and “Governor Johnson.” Variations of these keywords are not included. Data was manually collected from the Library of Congress’ Chronicling America archives. (1) Mentions are more likely to occur in an election year than in a non-election year. The only instances in which the latter supersedes the former is during the governor’s first year in office. Otherwise, non-election years tend to trail, and this is true even when there are major events such as when Johnson died in office (1909). The exception to this is Lind whose 1899 totals were only slightly better than in the year between his two gubernatorial campaigns (1897). (2) The prominence of these individuals in state newspapers corresponds strictly to their time in office. The exception to this is again Lind who, coincidentally, served the fewest terms (one). This may be due to the fact that, compared to the others, only Lind had a political career outside of the state legislature, having served in the U.S. House of Representatives from 1887-1893 and later 1903-1905. The spikes one sees afterward mark particular events: In 1910 it was widely-speculated that he would run for governor again (he didn’t) and in 1913, Lind’s friend, Secretary of State William Jennings Bryan, appointed Lind an emissary to Mexico during that country’s revolution. (3) An individual’s prominence in state newspapers reached its highest point during their first reelection campaign. This observation, though, is a little problematic as only Governor Johnson was elected to a third term — even so it is fascinating that this is still the case when, in 1908, Johnson also ran for the Democratic Party’s nomination for president. Lind’s uniqueness makes sense given his being endorsed by the Democratic, Populist, and Silver Republican Parties at the height of the Populist Movement in Minnesota (1896-1898). Once this subsided, so too did his prominence (Lind was the state’s first and only Populist governor). (4) There’s something going on with John Lind. Although I’ve already noted his exceptionalism, it’s something that, without this graph, would be otherwise unapparent. Right now I’m in the process of writing an article on Lind that will (hopefully) shed light on his uniqueness. Subscribe and keep an eye out for it. Is there anything else that stands out? Any other research questions from this period you’d like me to look into? Let me know in the comments!